Formwork & Reinforced Concrete for Sea Defences, Aberaeron, Ceredigion, Wales. The Situation: Our client, Bam Nuttall required a specialist contractor to carry out all of the Formwork and Reinforced Concrete works and concrete repair to sea defences situated at Aberaeron, Ceredigion, West Wales. The Solution: Trueform provided the skilled labour, formwork and falsework that was required for this challenging marine contract. Precast Reinforced Concrete for Liquid Natural Gas terminal, Milford Haven, Pembrokeshire, Wales. The Situation: Besix-Kier required a specialist precast reinforced concrete contractor to manufacture all of the components for the new jetty at SHLNG (South Hook Liquid Natural Gas) terminal. This is the largest Liquid Natural Gas terminal in Europe, situated near Milford Haven, Pembrokeshire. The Situation: Prime Contractor Costain were looking for a specialist formwork, reinforcement & concrete contractor with excellent health, safety and quality reputation. The Solution: Trueform provided all of the necessary skilled labour, formwork and falsework design calculations. Though collaboration Trueform were able to overcome design and programme issues as the contract rolled out. The Benefits: Trueform’s experience and quality assurance systems ensured that the contract was completed on time and within budget to the highest standards. Our collaborative approach to working as part of a wider team with other contractors ensured smooth delivery of our element of the project. “Trueform formed an extension of our team and helped to ensure the project achieved an award for constructing excellence” Dave Morris, Structures Agent. The Situation: OPCO required hundreds of diamond-drilled holes to be cored through reinforced concrete for services and ventilation ducts. The Solution: Trueform keep in stock numerous diamond drilling rigs and various core bits and have a team of specialists to carry out this operation. This new bridge in Aberdare was constructed to carry traffic over the river to a new sports facility. The bridge was constructed on time despite the river breaking its banks and flooding on several occasions. A new 45 metre span bridge to replace the old bridge that had structural defects was constructed at Rand y Moin, Nr Llandovery. 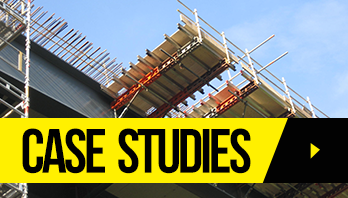 Web tie and Paraslim were the preferred falsework systems on this bridge due to its inaccessible nature. A replacement bridge which utilized the existing abutments. Precast beams and GRP decking where used for the main 3 spans. Trueform undertook the pre-casting of a new bridge for Railtrack at our pre-casting facility in West Wales. Extremely high tolerances had to be achieved as only one position was allowed for the installation of this new bridge.